Ok, so this isn't exactly breaking news, but I thought I'd write something about it anyway because GODAMMIT I'M JUST SO EXCITED!!! I've been out of the country for the last week or so and I missed all the breaking news; then I came back to see Betrayal at Calth splattered all over the rumour sites. I'm not exaggerating when I say I was on the phone to my local pusher immediately (ok, maybe pusher is a little harsh, perhaps dealer is more appropriate?!) I've simply got to have one of these, the miniatures would make splendid additions to my Night Lords and it would give me another GW board game to share with (infect) my local board games group. Now much has been said about GW releasing one off, limited run type board games (although I'm hearing this won't be limited). I've read many complaints and disparaging comments about the quality of the games, the miniatures and the pricing of both. I for one, believe that the quality of GWs miniatures has gone from strength to strength in recent years. If you think that any manufacturer in the world can match the quality of GWs plastics for the same price point then I urge you to go and pick up a copy of Dark Vengeance. The detail and casting quality on those Chaos Chosen blows my mind every time I pick one up. Not only that but they're snap-fit models to boot! Anyway I digress. The point is that I'm very excited to see the new Heresy plastics; I can only imagine that the quality will be sublime. Moving on to the game itself, which it seems is playing second fiddle to the miniatures in the minds of most fans. Judging from my past experiences of GW board games I can say that I'm looking forward to this side of Betrayal at Calth as well. I am fortunate enough to own both the latest release of Space Hulk and Execution Force and I can say that I've enjoyed both games thoroughly. They both work well with two players but can be easily adapted to accomodate teams of players on both sides (IMHO the best way to play Space Hulk). Now speaking of pricing, we all know it's going to be £95 (here in the UK). That's a lot of money, it really is. But is it good value? Many people have compared price points with the Heresy range from Forge World. Obviously it works out cheaper if you look at it this way (though estimates of exactly how much seem to vary wildly). For me, it was a no-brainer. The miniatures fit nicely with one of my fledgling armies and the fact that I can customise them with legion specific shoulder pads and trophies etc means that it will be easy to make them unique. 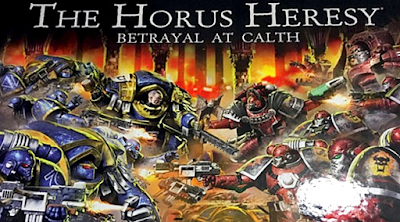 Essentially, for anyone looking to start playing battles in the Age of Darkness, Betrayal at Calth should be an obvious starting point. Whilst I'm on a bit of a pro-GW rant. Lets talk about the modern iteration of 40k, with a particular nod to rules writing and in-game balance. If you float around these here internets (like I do) then you're bound to have come across a swathe of comments, articles and general whining about game imbalance, codex creep and generally stuff just being OP or UP etc. Now I'm the first to admit that the game isn't balanced; I'll even go so far as to say that GW intentionally uses this imbalance to sell shiny new models. But I ask the question, has the balance of the game improved or worsened over the years? The overwhelming answer has to be yes, massively. I've played most editions of 40k (I missed Rogue Trader and 3rd Edition) including a lot of 2nd Ed (which I still play regularly.) Comparing the 2nd edition rules with 7th shows a clear improvement in terms of rules clarity, cross-codex balance and points values. Don't believe me? Dig out your old 2nd Ed stuff and get a couple of games under your belt without wearing your rose tinted specs. I guarantee you'll agree before the end of turn 2. Alright, rant over, the message is this. Yay GW! Please keep making and improving shiny toys that I want to buy!